Hawaiian coffee and smoothie retailer brings back its popular Orchard Peach smoothie for a limited time only. Orchard Peach returns to Maui Wowi for a limited time. It’s fresh, healthy, all-natural and the perfect warm weather treat to kick off summer. Maui Wowi Hawaiian’s popular summertime smoothie, Orchard Peach, is reemerging from hibernation and ready to satisfy customers’ cravings. The retailer of authentic Hawaiian coffees and freshly blended smoothies is bringing back its Orchard Peach smoothie for a limited time at participating U.S. Maui Wowi fixed retail locations, kiosks, and event carts beginning May 22. 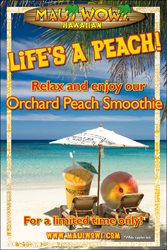 Orchard Peach is returning to blenders for its fourth year thanks to overwhelmingly positive customer feedback. It will only be around while supplies last and the company is encouraging fans to get it while they can. Maui Wowi, an international franchise and leader in mobile concessions, first introduced the new flavor in 2012. Made with peach fruit purée, live active yogurt, and a banana, the Orchard Peach smoothie has quickly become a seasonal favorite. The company also offers a variety of other flavors that include strawberry banana, piña colada, black raspberry, lemon wave, mango orange, and kiwi lemon-lime, which can also be combined to create fun, unique flavors.